[In the Lucky Millinder Orchestral] there was — you remember Wynonie [Harris], God bless him? He went a few years ago — you know, he'd say, "I don't want to sing tonight!" You know, he'd go through his changes. So at that time we were in Lubbock, Texas, and they used to put up chicken wire to keep the [thrown] whiskey glasses away from the band. So at that time "Hurry, Hurry" was very popular by Wynonie, and Trevor Bacon — he's gone too —he heard me humming around on something. And we had Panama Francis on drums (those were the ones that named me Bullmoose. They said, "You look like a moose coming over the hill!" So that name stuck, and has been very good to me all through these years), so then I got up and sang, and got a good hand... and stopped the riots! Bullmoose Jackson interviewed on the Johnny Otis Show (31/12/84). Due to Jackson's success as a vocalist — both with raunchy R&B and smooth ballads — on King Records from 1945 to 1955, it is seldom remembered these days that the Moose was a highly respected jazz saxophonist. He had accompanied the likes of Lena Horne on sessions cut for the Armed Forces Radio Service and recorded for Capitol with the all-star Big Sid Catlett band among such legends as Illinois Jaquet, Joe Guy and Horace Henderson, before ever opening his mouth to fill in for the errant Mr. Blues. Fortunately he continued to record the occasional sax instrumental throughout his career, and wonderful blues and jump arrangements like Moose On The Loose (Superdisc), Moosey, Bearcat Blues, Bootsie and Johnny Hodges' Hodge-Podge (all King recordings, the latter three of which are included here), showcase his mastery over his instrument. As B.B. 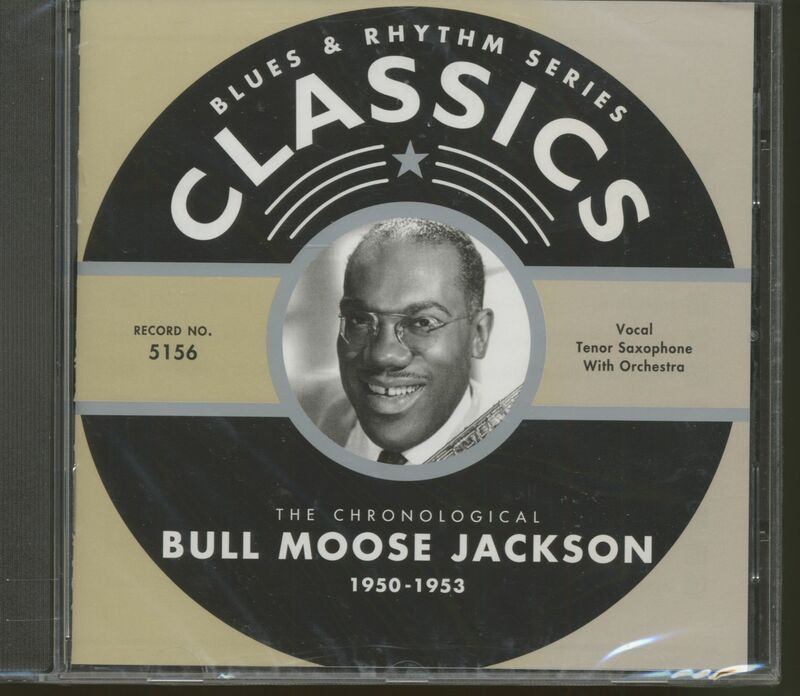 King told Arnold Shaw in Honkers And Shouters, "Bullmoose Jackson was a favourite somewhat. He had a few tunes that I liked — one of them was I Love You, Yes I Do. I liked everything he did, but I liked him as a saxophone player." Benjamin Clarence Jackson jnr was born in Cleve-land, Ohio, in 1919, and became interested in music at a very early age. At the age of three he was soloist with the Junior Choir of the Avery M.E. Church, and the following year began receiving weekly tuition for singing and violin. By the time he started school, young Benjamin was sufficiently adept at the fiddle to be made featured violinist in the school band. He told Johnny Otis, "Well, my mother and father wanted me to be a concert violinist. And now back in those days there was no openings for black musicians in the Philharmonic or the New York Symphony, or whatever. So when I went into high school, the other kids that weren't fortunate to have a mother and father who paid that dollar a week for violin lessons, I was way ahead of them, and I felt a little silly with that violin, so I took up saxophone. I was self-taught, I did take a few lessons, you know, to get a little technique..." Upon graduating in the mid 1930s, Jackson joined the band of Freddie Webster's, The Harlem Hotshots, and played with several other local bands until 1942 when he moved to Buffalo, New York State, for a year to increase his experience. In 1943 he returned to Cleveland and a job with Shedina Walker, the pianist and leader of the house band at Cleveland's Cedar Gardens Club, and it was here that Jackson was "discovered" by popular bandleader, Lucky Millinder, who was headhunting a replacement tenorman for Lucky Thompson who had recently quit. Legend has it that Millinder brought his entire reed section, consisting of Preston Love, Kent Pope, Elmer Williams and Son Leavy, along to the Cedar Gardens and auditioned Jackson with them right on the stage to see if his sound fitted in with the others! He obviously did; and became a valued and valuable member of the Lucky Millinder Orchestra, contributing to many of the band's Decca recording sessions musicially, and on Chittlin' Switch (Chitterlinswitch) (Decca 18835), both vocally and saxophonically. 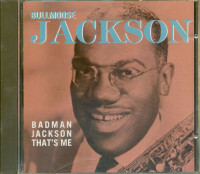 It was around this time that Jackson was given his less-than-flattering sobriquet, as he remembers it, by Panama Francis and Trevor Bacon (although Preston Love recalls that trumpeter Joe Jordan started calling Jackson "Bullmoose" due to his resemblance to a comic strip character of that name), and started recording for Syd Nathan's Queen label. This came about through Nathan's obsession with the Millinder band: he wanted them to record for his new label, but due to their exclusive contact with Decca, he arranged a series of moonlight sessions for the band under the names of Panama Francis, Sam "The Man" Taylor, Annisteen Allen and Bullmoose Jackson, instead of Lucky's writ-worthy name. 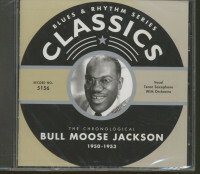 The first sides cut in August and December 1945 under Jackson's name, with a little-big unit from the Millinder band, were mainly fine jump instrumentals —with brief ensemble vocal spots and longer solo contri-butions from the likes of Money Johnson on trumpet, Bullmoose or Sam Taylor on tenor and Burnie Peacock on alto — or modernised, barnstorming swingers, like the Sweet Georgia Brown-based Jammin And Jumpin. 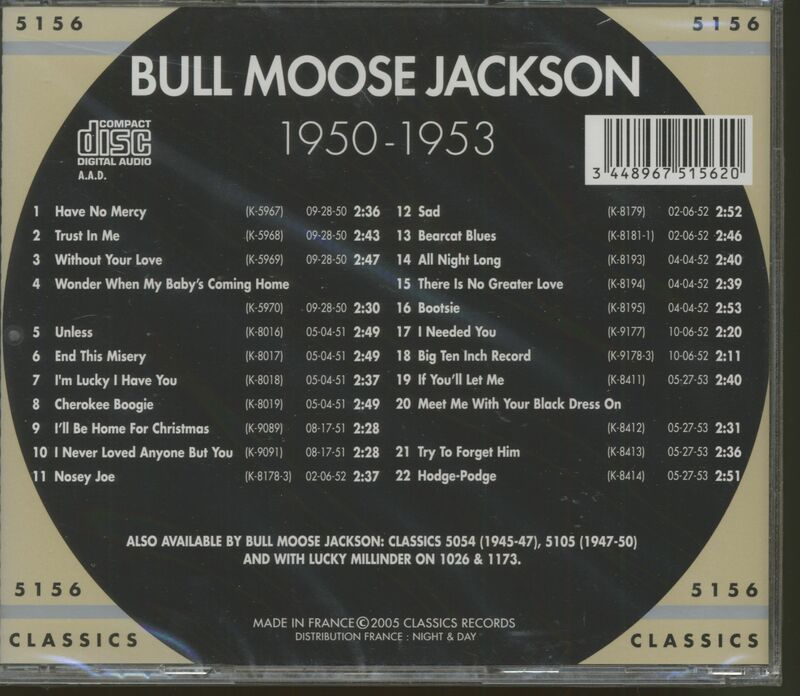 A couple of the sides cut, with Jackson singing a cool blues, such as Bullmoose Jackson Blues and Bad Man Jackson, That's Me, however were more indicative of the direction his fortunes would like, although his major chart hits were all smooth ballads, such as All My Love Belongs To You, Don't Ask Me Why, Little Girl Don't Cry, and the million selling I Love You, Yes I Do — as Arnold Shaw wrote, "... more lover-boy Benjamin than horny Bull Moose" — these have been ignored for this compilation in favour of the jump and blues gems that often skulked on the flip sides, with the exception of the easy-on-the-ear (Let Me Love You) All Night Long by way of example. 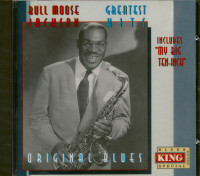 Certain of Bullmoose's King recordings have earned notoriety, along with sides by Wynonie Harris, as some of the most explicit in R&B, as tracks such as I Want A Bowlegged Woman, Leiber and Stoller's early Nosey Joe, and the infamous Big Ten Inch (Record) display, but like many of King's major stars, Bullmoose was also used to cover other R&B hits of the day, often doing as good or even better a job than the original, as Joe Liggins' The Honeydripper, Jimmy Nelson's Meet Me With Your Black Dress On, and Buddy Griffin's / Wanna Hug Ya, Kiss Ya, Squeeze Ya demonstrate. Another excellent policy pioneered by Syd Nathan (probably due to financial rather than artistic considera-tions), was the recording of his black stars with his successful hillbilly material and vice versa: in the early 1950s, Jackson was reasonably successful with covers of Wayne Raney's Why Don't You Haul Off And Love Me and Moon Mullican's Cherokee Boogie (Eh-Oh-Aleena), again both of these are included in this collection, with the latter being an alternative take to that issued by King. Like many of his generation, the rock 'n' roll years were not good to Bullmoose: after leaving King in 1955, he recorded an unissued set for Chess's short-lived Marterry subsidiary, following it in 1956 with a session on the West Coast for the small Encino label. Around the turn of the decade, Jackson and what was left of the old Millinder outfit recorded for Warwick; and a new recording of his biggest hit I Love You, Yes I do for the 7 Arts label, despite a reasonable placing on the chart again in 1961, called a halt to his recording career for more than twenty years. During the 1960s and 1970s Bullmoose led a dual existance after moving to Washington DC, by working for a catering firm at Smithsonian Institute receptions during the week and leading a jazz trio at weekends. In 1975, he had a cameo appearance in the film Sincerely The Blues (his last film had been Boarding House Blues with Lucky Millinder shortly before leaving the band in 1948), which was a shot in the arm for his musical career, and appearances with a jazz band at the Smithsonian, a tour of France and North Africa with Buck Clayton's Quartet, and a guest spot at Metro's All Star Jazz Concert followed in the late 1970s. 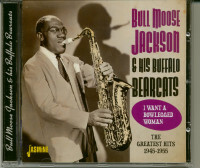 In the 1980s, with the help of Route 66 Records in Sweden and their two Jackson reissues, Bullmoose was "rediscovered" by R&B revival groups like Rent Party and even heavy rock groups like Aerosmith, who were attracted to salacious songs like Big Ten Inch, and Jackson was tracked down and made guest appearances with the Pittsburgh-based Flashcats (who had previously covered Nosey Joe). These were followed with an enthusiastically received single, Get Off The Table, Mable, and a new album, Moosemania!, and all this activity made 1985 one of Bullmoose's golden years, with a nationwide tour — including Carnegie Hall — and the European Northsea Jazz Festival with the Johnny Otis band, topped off with an inspired substitution when the Victory Tour of Michael Jackson (no relation) was cancelled in Pittsburgh, and Bullmoose Jackson's Victrola Tour took its place. Consequently, 21st June 1985 was proclaimed 'Bullmoose Jackson Day' in Pittsburgh. Bullmoose was pleased and grateful for his new status, saying, "They've resurrected an old man. I had one foot on a banana peel and the other in the grave. They dug me out and here I am. I'm elated that I can still perform, and I'm very proud people still remember." Sadly his 'second career' was short-lived and he spent the last year of his life in a Cleveland care centre before being transferred to hospital where he succumbed to lung cancer on 31st July 1989. DAVE PENNY — February 1991 Sources Blues & Rhythm — The Gospel Truth Nos. 12 (Sept 1985) and 47 (Oct 1989). Customer evaluation for "The Chronological Vol.3 (CD)"